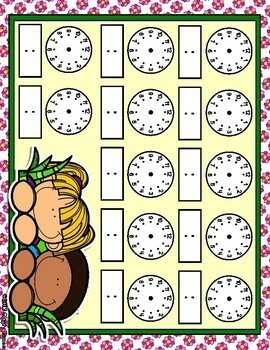 My telling time practice mats are a fun and educational way to encourage children to learn to tell time. The mats are 8.5 x 11 and include both analog and digital clock graphics. The graphics are colorful, crisp and clear. I make it a point to use colorful graphics and patterns on each mat to attract and keep the attention of the child. Print directly on heavy cardstock and laminate or print on copy paper and affix to colorful cardstock before laminating for added color!! 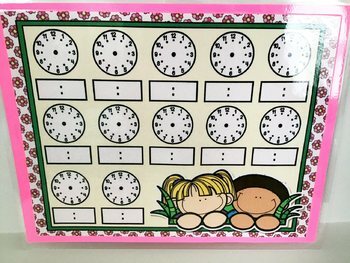 Once laminated you can use a Sharpie to draw clock hands or digital time or both to mix it up and have the student write the matching clock face or digital time that matches. Dry erase markers simply wipe off once laminated and Sharpie marks can be removed later by an adult using a cotton swap with rubbing alcohol. Make sure you follow my store here on TPT by clicking the star above to stay updated on my new and free resources. Follow “Giggly Games” on FaceBook, Instagram, Pinterest, and Twitter to stay connected also.